most complete idea of what PMC does in our community. Need a Health Expert to Speak to Your Group? 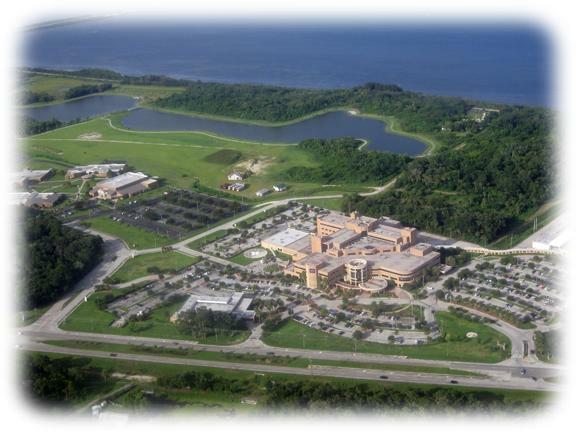 Parrish Medical Center (PMC), a Parrish Healthcare integrated care partner, is located at 951 N. Washington Ave., Titusville, Florida. The 210-bed, not-for-profit acute care public medical center has been serving Brevard County for 60 years. PMC is the first in the nation to be Integrated Care certified by The Joint Commission and is nationally recognized as One of America's Finest Healing Environments®. PMC maintains top-tier national rankings for clinical outcomes, safety and patients' experiences according to CMS, The SafeCare Group, The LeapFrog Group, The National Patient Safety Movement and The Joint Commission. PMC is also nationally recognized among the best places to work in healthcare. 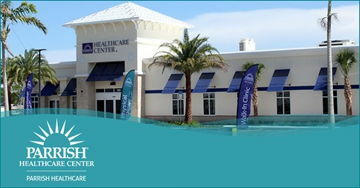 For more information about Parrish Medical Center, its programs and services, please visit www.parrishmed.com and www.healthbridge.parrishmed.com or call 321-268-6110. The Children's Center, an affiliate of Parrish Healthcare, offers a variety of learning and early development programs for area children. Located at 5650 South U.S. 1 in Titusville, The Children's Center consists of eight local partner agencies working together to meet the needs of children. The center annually serves nearly 2,000 children and their families. Visit The Children's Center online at parrishchildrenscenter.com. Parrish Healthcare, America's first Joint Commission Integrated Care Certified network, includes: Parrish Medical Center, a Mayo Clinic Care Network member and one of the nation's most recognized hospitals for clinical quality, patient safety, and healing environments; Parrish Medical Group, NCQA certified patient-centered medical homes; and Parrish Health Network, a coalition of healthcare providers, insurers and others working together to improve quality and safety and lower healthcare costs on behalf of individuals, families and businesses. For more information, visit www.parrishhealthcare.com. 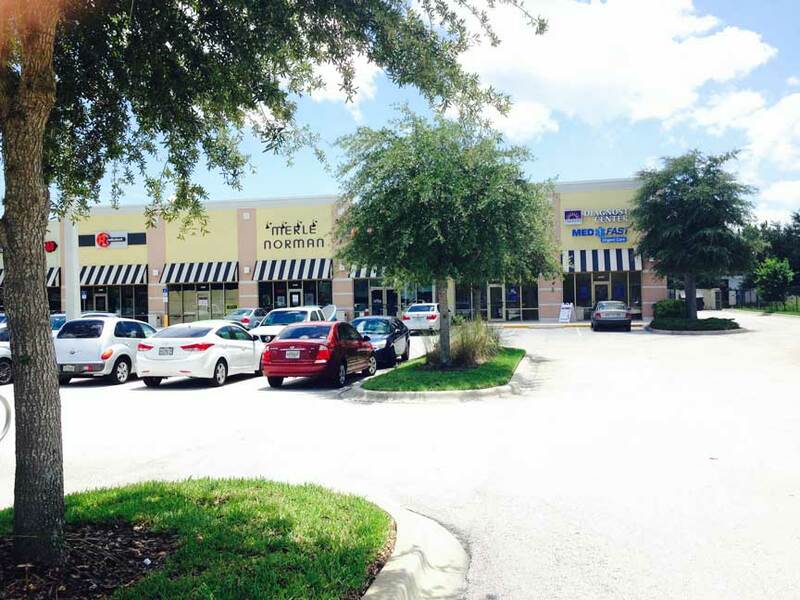 Parrish Health & Fitness Center is North Brevard's only medically integrated wellness center. It features state-of-the-art strength and cardiovascular training equipment, multiple weight-training rooms, two indoor heated pools, personal fitness training, wellness coaching, more than 80 weekly group fitness classes, and much more. Located at 2210 Cheney Highway (Hwy 50) Titusville, FL 32780. Call 321-268-6200 for more information, or go online to parrishhealthandfitness.com. Parrish Healthcare Center, located at 5005 Port St. John Parkway, Port St. John, is an eco-friendly, diagnostic healing environment featuring laboratory and nuclear medicine services; comprehensive imaging (Xray, Ultrasound, Mammography, CT/MRI, etc.) services; rehabilitation therapy services; as well as Medfast Urgent Care Center; Parrish Sleep Disorders Treatment Center; Parrish Wound Healing Center; and Parrish Medical Group physicians (located on second floor). Parrish Healthcare Center is a Parrish Healthcare regional integrated care partner. For more information visit parrishmed.com/programs-services/healthcare-center-at-psj. 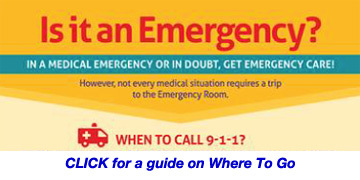 or call 321-636-9393.
is a four-bed sleep center where studies are done seven days/nights a week. Diagnostic testing is done for sleep apnea, narcolepsy, REM behavior disorder, maintenance of wakefulness test, nocturnal seizures, and shift-work sleep studies during the day. Continuous follow-up care for Sleep Apnea is also done for patients with CPAP machines. 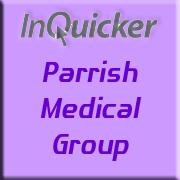 Parrish Medical Group Diagnostic Center is a service of Parrish Medical Group (PMG), North Brevard's largest network of primary care physicians and specialists. Hours of operation are Monday–Friday, 7:00 a.m.–7:00 p.m. at the Target Shopping Plaza. For appointments, call 321-268-6MRI (6674). Lab services are available until 3 p.m. and no appointment is necessary. Through philanthropy and volunteerism, JPMF supports Parrish Medical Center's mission of healing experiences for everyone all the time®. JPMF partners with the community to raise funds that sustain and enhance healthcare services in North Brevard County. Whether caring for seniors or helping children reach their full potential, JPMF is helping improve, transform and save lives. For more information about Jess Parrish Medical Foundation, call 321-269-4066 or visit www.parrishmedfoundation.com. located at 390 Challenger Road (just off George King Blvd. across from Cruise Terminal 1). Parrish Healthcare has opened a new healthcare facility at Port Canaveral that will provide a primary care/walk-in clinic as well as occupational medicine services, workers' compensation care, diagnostics, physical therapy, industrial rehabilitation and sleep disorder services. The center is open from 7 a.m. to 7 p.m. on weekdays, and 7 a.m. to 4 p.m. on Saturdays and Sundays. For more information or to schedule an appointment, call 321-633-8640. or visit OUR WEBSITE. The PMC Auxiliary, Inc. was formed in 1959 for charitable and educational purposes to promote and advance the welfare of Parrish Medical Center consistent with the goals and objectives of the hospital as approved by its governing board. The Auxiliary donates thousands of dollars yearly to hospital programs and projects, as well as scholarships for students pursuing a degree in a health-related field. The PMC Auxiliary helps in hundreds of ways, large and small, to make one of America's finest healing environments® even better. For more information about the PMC Auxiliary or to become a volunteer, please call 321 268-6333 extension 7183. CLICK for August, 2016 flyer. A service of Parrish Medical Center, Parrish Senior Solutions, 805-A Century Medical Drive, Titusville, Fla., assists seniors and caregivers (spouse, children, family member or friend) with finding the services and information they need. Geriatric patients and their caregivers will find information about support services, educational materials, and information about health concerns and community resources. It also serves as a lifeline to long-distance caregivers—children who do not live in the area but want to ensure their parents and loved ones have the services and support they need. The A.W.A.K.E. support group is part of a national network of voluntary support groups affiliated with the American Sleep Apnea Association. The ASAA, founded in 1990, is a 501(c)(3) nonprofit organization that promotes awareness of sleep apnea, works for continuing improvements in treatments for this serious disease, and advocates for the interests of sleep apnea patients. The ASAA is dedicated to reducing injury, disability, and death from sleep apnea and to enhancing the well-being of those affected by this common disorder. The ASAA promotes education and awareness, the ASAA A.W.A.K.E. Network of voluntary mutual support groups, research, and continuous improvement of care. Mayo Clinic is a nonprofit worldwide leader in medical care, research and education for people from all walks of life. For more information, please visit www.mayoclinic.org/about/ and www.mayoclinic.org/news — PRESS RELEASE. 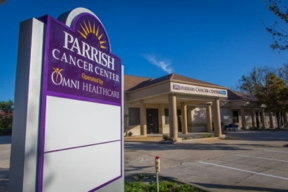 Parrish Medical Center and OMNI Healthcare have joined forces to provide the services and technology you expect from a world-class cancer center. As a member of the Mayo Clinic Care Network, Parrish Cancer Center and Mayo Clinic are working together giving you access to the latest clinical research and cancer treatment options available anywhere. For more information, visit WEBSITE . OMNI Healthcare is a multi-specialty physician group practice formed by physicians practicing in Brevard County, Florida. This physician-owned and physician-managed organization came together for the purpose of providing high-quality medical care to the citizens of Melbourne and surrounding areas. 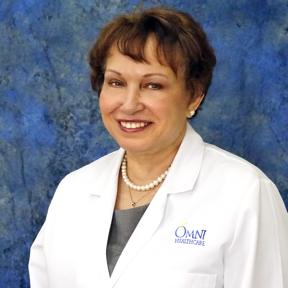 The physicians of OMNI Healthcare are committed to the highest standards of quality and comprehensive healthcare. OMNI includes physicians in the primary care specialties of internal medicine, family medicine and pediatrics, as well as physicians in various subspecialties such as cancer care and surgery. For more information, visit www.omnihealthcare.com . Oncology Resource Networks (ORN) is committed and dedicated to the delivery of value based cancer care. ORN bridges the gap between payers and providers building common ground in evidence based medicine and patient centered care while enhancing affordability. ORN provides oncologists with the tools necessary to transform their practices from volume practices to value based practices. ORN's core offering is a value based provider network representing physicians throughout the country committed to value based care. ORN provides physicians with access to the Oncology Value Optimizer, a population health software tool that measures and promotes quality care while enhancing efficiency, and provides physicians with incentives to deliver cost effective cancer care. ORN supports payers by managing the transition to value based contracting models and innovative payment methodologies. ORN develops and implements programs that improve practice performance and can support provider success in the CMS Oncology Care Model and other value based payment methodologies. For more information, visit www.oncologyresourcenetworks.com . TITUSVILLE, FLA. (April 8, 2019)—Parrish Medical Center is offering a free community health presentation about stroke as part of its HealthBridge series. Stroke: Symptoms, Types, Treatment and Prevention is scheduled Wednesday, May 8, from 5-7 p.m., at The Indian River Preserve, located at 3950 Walkabout Way in Mims. Stroke affects about 700,000 Americans each year. With the right care at the right time, many will survive. Pamela Tronetti, DO, AGSF, and the Medical Director of Parrish Senior Services, will talk about what you need to know about stroke symptoms, associated risks, prevention and treatment. Thermal Imaging Camera and CPR Manikins for the Titusville Fire Department to provide critical rescue technology to assist firefighters to "see through the smoke" to locate and save victims. Playground repairs at The Children's Center to ensure the children can continue to enjoy the playground within a safe, healing environment. "These generous gifts are helping us fulfill our vision of Healing Families–Healing Communities®," said Misty Wilson, director of Jess Parrish Medical Foundation. "We thank our care partners for their continued generosity and support for the annual Circle of Giving Campaign. Together, we are making a difference in the lives of Brevard residents." TITUSVILLE, FLA. (March 25, 2019)—Parrish Medical Group physicians Benjamin Nettleton, DO and Rhu-Jade Raguindin, MD are offering $10 sport physicals to local Boy Scouts on Saturday, April 20 from 8 a.m.-1 p.m. The physicals will be held at Parrish Healthcare Center Suite 2500, located at 5005 Port St. John Parkway in Port St. John. Dr. Nettleton and Dr. Raguindin are volunteering their time and expertise to benefit North Brevard County Boy Scout Troops. "This is an opportunity to ensure our young people are physically able to participate in scouting activities," said Dr. Nettleton. "If an individual has a physical condition that would prevent or prohibit their participation in sports and other activities, we can identify that early on." TITUSVILLE, FLA. (March 22, 2019)—Parrish Medical Center is offering a free community health presentation about heart health with Biju Mathews, MD, medical director of Cardiovascular Services at Parrish Medical Center as part of its HealthBridge series. Your Heart Matters is scheduled Wednesday, April 10, from 5-7 p.m., at The Blue Heron, located at 137 Plantation Drive in Titusville. TITUSVILLE, FLA. (March 19, 2019)—Jess Parrish Medical Foundation (JPMF) has announced the law firm of Zumpano Patricios as the presenting sponsor for the annual Fran Gerrett Memorial Golf Classic on Friday, April 12. More than 200 golfers are expected to play in the two-course tournament with all proceeds benefiting The Children's Center (TCC), a service of Parrish Healthcare, and one-stop childhood development resource center. TCC provides a safe and healing environment for special needs and/or typically developing children to learn and grow, along with an array of health, education and human services under one roof. "Zumpano Patricios is honored to continue its tradition of supporting the Fran Gerrett Memorial Golf Classic as presenting sponsor again this year. We believe the Foundation's mission of providing healing experiences to families is fundamental to advancing the future of our youth, and it is our privilege to extend our financial support to the vital programs and services offered at The Children's Center," said Joseph I. Zumpano, managing shareholder at Zumpano Patricios. Registration begins at noon, with a shotgun start at 1 p.m. Tournament players can choose between two golf courses – the Ron Garl and Lee Trevino-designed La Cita Golf & Country Club nestled amongst 100-year old oak trees or The Great Outdoors with the beautiful natural environment of the St. Johns wildlife refuge. Course selection is first-come, first-choice with paid registration. The tournament format will be a four-player scramble with fun contests, including a chance to win a $1,000 cash prize when purchasing a raffle ticket for $20. Participants need not be present to win. Winners will be announced immediately following the awards ceremony. The tournament is a fun-filled event which allows you to golf and give back at the same time. Fran Gerrett served as the director of Materials Management at Parrish Medical Center for 24 years. Fran passed away in 2012, but the annual golf tournament lives on as a tribute to his longtime dedication to our community and favorite charity, The Children's Center. The golf classic is organized by community leaders and volunteers. Event co-chairs are Kathy Myer and Greg Sparkman. Other members of the golf committee include Santi Bulnes, Amy Craddock, Anita Currie, Lori Duester, Leigh Spradling and Suzanne Yarbrough. The foundation welcomes all businesses and organizations to participate and support the event. A variety of sponsorship opportunities are available beginning at $500. Individual player costs are $85, which includes golf, lunch and dinner. For more information about sponsorship packages or to purchase general admission and raffle tickets, please call Jess Parrish Medical Foundation at (321) 269-4066 or visit www.parrishmedfoundation.com/golf. TITUSVILLE, FLA. (March 18, 2018)—Parrish Medical Center is offering a free community health presentation about sleep and the essential role it plays in maintaining a healthy heart as part of its HealthBridge series. Sleep and Your Heart is scheduled Thursday, April 18, from 5-7 p.m., at the Holiday Inn, located at 4715 Helen Hauser Blvd. The event is free but space is limited for this catered event. For more information, and to register, visit parrishhealthcare.com/events or call 321-268-6156. People who don't sleep well are at higher risk for cardiovascular disease and coronary heart disease—regardless of age, weight, smoking and exercise habits. Join us to learn about the importance of sleep and the essential role it plays in your heart health. Kristina Weaver, NREMT-P, RPSGT, Parrish Sleep Center manager, will share information about how you can improve your sleep and your overall health. TITUSVILLE, FLA. (March 14, 2019)—Parrish Healthcare welcomes Dr. Patricia Deisler, MD, as its newest board-certified physician at the Parrish Cancer Center, located at 845 Century Medical Drive, Suite B in Titusville. Dr. Deisler is joining the existing team at Parrish Cancer Center, including Craig K. Deligdish, MD, board certified hematologist/oncologist; Cecil Robertson, MD, board certified hematologist/oncologist; Thomas F. Scheer, MD, FACRO board certified radiation oncologist; and Brian Bement, RTT, ASRT, ARRT, radiation therapist. Dr. Deisler completed her undergraduate studies at Columbia University and her medical degree at Weill Cornell School of Medicine in New York. She then finished her internal medicine residency at St. Luke-Roosevelt Hospital Center in New York and Hematology-Oncology Fellowship at Cornell University Medical College. Dr. Deisler began and developed the Hematology-Oncology Clinic in Mankato, Minnesota. This clinic proved to be one of the most successful oncology practices in the area. She is an active community leader, having presented on topics relating to cancer and holding positions in a variety of oncology committees such as co-director of the Mankato Clinic Breast Center and chairman of its tumor board. Dr. Deisler believes in delivering world-class cancer treatments in a loving and caring environment for every patient. TITUSVILLE, FLA. (March 5, 2019)—Parrish Healthcare is proud to announce its strategic partnership with athenahealth, a leading provider of network-enabled services for hospital and ambulatory customers nationwide. With the powerful and patient-friendly technology of athenahealth, patients choosing to receive their care within Parrish Healthcare's nationally integrated care certified system will experience seamless connectivity to their physicians, other care partners, and to their health information. The technology also makes it possible for Parrish Healthcare to follow care seamlessly across settings—doctor's office, diagnostics, or hospital — with all of the relevant information needed to manage health outcomes in easy reach. "athenahealth is another example of the kinds of strategic partnerships that have contributed to Parrish Healthcare being the nation's only certified integrated care system," said George Mikitarian, president and chief executive officer, Parrish Medical Center | Parrish Healthcare. "Other strategic partnerships, of which we are proud, that benefit the health and wellness of the people (and populations) we serve include the Mayo Clinic Care Network, Nemours Children's Health System, DaVita Dialysis, OMNI Healthcare, among others," said Mikitarian. TITUSVILLE, FLA. (Feb. 25, 2019)—Parrish Medical Center is offering a free community health presentation about nutrition, sleep and maintaining a healthy weight as part of its HealthBridge series during National Nutrition Month. The Dream Diet is scheduled Wednesday, March 28, from 5-7 p.m., at The Blue Heron, located at 137 Plantation Dr. in Titusville. If you're trying to lose weight, the amount of sleep you get may be just as important as your diet and exercise. Evidence shows that sleep may be the missing factor for many people who are struggling to maintain a healthy weight. Join us to learn more. The event is free but space is limited for this catered event. To preregister, call 321-268-6156 or visit parrishhealthcare.com/events. TITUSVILLE, FLA. Feb. 22, 2019—Titusville's Fire and Emergency Services Department presented Jess Parrish Medical Foundation (JPMF) with $1,300 in support of cancer care programs at Parrish Medical Center (PMC). During the month of October, as part of nationwide and local efforts to raise breast cancer awareness, Titusville's Fire and Emergency Services Department showed their support by going pink for the cause. Department members sold and wore pink-themed T-shirts in October in place of their uniform shirts in observance of breast cancer awareness month. "For the fourth year, Titusville Fire is honored to be able to give back to the Jess Parrish Medical Foundation and support PMC's cancer care programs. We look forward to continuing our partnership for years to come," said Gregory Sutton, battalion chief. "Without the support of our local printer, Printboy, the community, and all those that purchased our breast cancer T-shirts, this would not be possible. Many of our members have family who have been affected by this terrible disease. Our job is more than running emergency calls, and it's a great feeling knowing the sale of that shirt, in some small way, helped someone dealing with breast cancer." Sutton, and members from the department presented the check to Shannon Luker, PMC breast health navigator and oncology program coordinator; Marsha Richardson, PMC director of oncology services; and Misty Wilson, director, JPMF. "We are grateful for the generous support and selfless commitment of our community partner, Titusville Fire and Emergency Services, for their ongoing commitment to those we serve in North Brevard and in helping to advance PMC's vision of Healing Families—Healing Communities®," said Wilson. "A cancer diagnosis is a difficult time for patients and their families. A breast health navigator who works directly with patients to coordinate care, free supplies through our Cancer Care Boutique, and mammograms for underinsured or noninsured patients are just a few examples of the services available to cancer patients through our cancer care program," said Luker. "TFD's generous donation will help provide continued support for our patients and their families throughout their cancer journey. We are very thankful for this generous and heartfelt donation." For more information, please contact JPMF at 321-269-4066 or visit parrishmedfoundation.com. TITUSVILLE, FL (Feb. 20, 2019)— The integrated health care system created by Parrish Medical Center (PMC) has earned recertification after an intensive review by America's premier health care accrediting body. Parrish Healthcare, a collaborative structure of health care partners, remains the nation's only certified integrated care system meeting the standards of The Joint Commission. The Joint Commission reviewers specializing in integrated care determined Parrish Healthcare again met the high standards to achieve certification renewal. "The Joint Commission's standards for recertification were even tougher than the first time," said George Mikitarian, PMC and Parrish Healthcare president and CEO. "That Parrish Healthcare has received it for the second time is a tribute to the collaboration and commitment of our care partners," said Mikitarian. "Certification makes the statement about the legitimacy of our integrated care system more clearly than a hundred marketing campaigns by health care organizations that haven't successfully put forth the same time, work, and resources to achieve accreditation." Parrish Healthcare's first certification was in 2016. The integrated care system created by PMC includes partners - such as Mayo Clinic and Nemours - that are independent of each other but work together within Parrish Healthcare with the goal of continuously improving patient care (Parrish Medical Center is also a member of the Mayo Clinic Care Network). "We're proud and humbled to have again accomplished this for our patients' benefit," said Mikitarian. TITUSVILLE, FLA. (Feb. 12, 2019)—Parrish Medical Center was again awarded an American Diabetes Association Education Recognition Certificate for its diabetes self-management education program. Parrish Medical Center's diabetes self-management education program has been recognized since 1999. Recertification occurs every four years and recognizes the program continues to offer high-quality education as an essential component of effective diabetes treatment. "The process gives professionals a national standard by which to measure the quality of services they provide," said Alexandra Gutierrez, PMC director of Community and Corporate Education. "It assures the consumer that he or she will receive high-quality service." The seven physicians—Germaine Blaine, Cynthia Bryant, Juan Castro, Ashish Dalal, Firas Muwalla, Brendan Prendergast, and Richard Sprawls, had sought a preliminary injunction against PMC, claiming their due process rights had been denied and that PMC's bylaws were breached. The Court's Order cited that "the Ad Hoc Committee found that the Medical Executive Committee could rightfully recommend denial of Plaintiffs' reappointment applications," and that such "...decision could rightfully be upheld following a hearing before the Ad Hoc Committee, a review by the CEO, and ultimate disposition by the Board. And at this stage, the Court finds no fault in this course of action—rather, the Bylaws contemplate denial of reappointment on such grounds so long as the reappointment process is followed." The court's decision validated the actions taken to not renew the physicians' privileges, said Joseph Zumpano of Zumpano Patricios the Miami, Florida-based firm representing PMC. TITUSVILLE, FLA. (Feb. 4, 2019)—Blue medical wraps used in Parrish Medical Center's operating rooms to cover and safeguard sterilized surgical instruments will find a second use in covering and safeguarding the homeless. 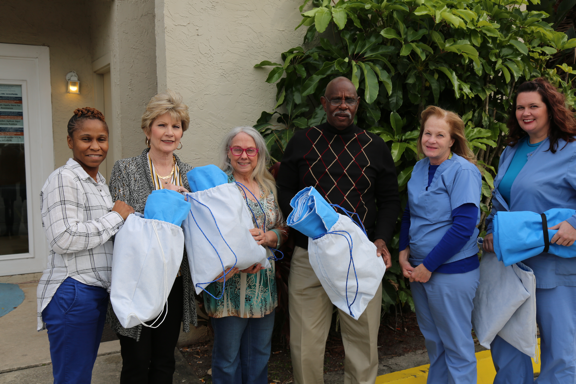 Pictured (left to right) North Brevard Charities Sharing Center's Lomika Hardy, Diane Patterson, Jonda Erwin, Joe Robinson; with Parrish Medical Center's; Sherry Pierce, CRNA, Rebecca Tipton, manager of Perioperative Services. The water-resistant, heat-sustaining wraps shield surgical instruments after they are sterilized for operating room use. The wraps are removed prior to starting the procedure so they don't come in contact with patients in the operating room. Hospitals typically discard or recycle the wraps. "I had seen the medical wraps could be converted for use by the homeless," Pierce said. "I thought about our hospital's vision, ÔHealing Families-Healing Communities®.' 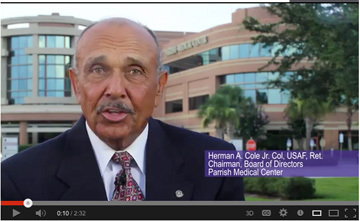 It's another way for Parrish Medical Center care partners to live our vision." A team of operating room care partners have volunteered to assemble and sew the wraps into mats, sleeping bags, pillows and drawstring travel bags. There's no set goal on quantities, but Tipton says, "The more the better." When the wraps are completed they will be donated to North Brevard Charities Sharing Center for their use in aiding the homeless. "When Sherry presented the idea, the surgical team was immediately enthusiastic it," said Matt Graybill, director of Perioperative Services. "By helping to keep them warm and dry, these wraps will be a comfort to those in great need." Tipton said that donating the wraps bring multiple benefits. The medical equipment is being reused instead of discarded. The recycled wraps provide comfort to those who will use them. This project gives Parrish Medical Center care partners another way to help people, which is why we work in healthcare. TITUSVILLE, FLA. (Feb. 1, 2019)— Parrish Healthcare is celebrating the one year anniversary of the Next Stepsª program with Parrish Health and Fitness Center. Next Steps™ is a specialized, eight-week fitness program helping people achieve their health and wellness goals while working to support any medical conditions they may have. Once approved with your medical insurance, you may be qualified to enroll in the program for free. You'll undergo a health assessment in order to have fitness experts design your unique plan based on your goals. "I have seen how this program has impacted many different people and changed their lives. Some participants have lost weight and regained confidences, while others have improved their stamina and energy to continue doing activities they love, like fishing and golf," said Tammy Shelley, fitness manager at Parrish Health and Fitness Center. "It important to me that we work with their referring healthcare provider to accomplish their goals no matter what medical condition they may be struggling with." Luis, a Next Steps™ graduate from Titusville said, "Next Steps™ has positively impacted my health. I was able to improve my stamina after my cardio surgery to continue my everyday tasks." Luis was also eager to comment on the trainers at Parrish Health and Fitness Center. He added, "This program has been excellent. My plan was managed and maintained in all aspects as I progressed throughout the program. My trainers were outstanding and made the process even more enjoyable." TITUSVILLE, FLA. (Jan. 22, 2019)—Parrish Medical Center is offering a free community health presentation about heart health with a panel of Parrish Healthcare cardiovascular team members as part of its HealthBridge series during American Heart Month. We've Got Heart is scheduled Thursday, Feb. 21, from 5-7 p.m., at Indian River Preserve, located at 3950 Walkabout Way in Mims. You put your heart into everything you do, and so do we. Join us and our cardiovascular care team to find out how to keep your heart healthy. Learn how our proven quality and safety track record in the prevention, diagnosis, treatment and rehabilitation of heart, lung and vascular disorders can play an important role in your overall health and wellbeing. TITUSVILLE, FLA, Jan. 10, 2019—Applications for the Karla Foster, RN, Memorial Scholarship are now being accepted for students pursuing nursing degrees. Scholarship applicants must be residents of North Brevard County; be accepted into a nursing program; and possess a 3.0 or better grade point average. The awardee will be provided $3,000 to be applied toward tuition, books, supplies or other expenses related to completing the student's nursing program. For additional information on applying, or to make a tax-deductible contribution to the Karla Foster, RN, Memorial Scholarship Fund, please contact the Jess Parrish Medical Foundation at 321-269-4066. The deadline for submitting applications is Friday, March 8, 2019. TITUSVILLE, FLA. (Jan. 8, 2019)—Parrish Medical Center is offering a free community health presentation about heart health with panel of Parrish Healthcare cardiovascular team members as part of its HealthBridge series. We've Got Heart is scheduled Tuesday, Feb. 5, from 5-7 p.m., at La Cita Country Club, located at 777 Country Club Drive in Titusville. The event is free but space is limited for this catered event. For more information, and to preregister, call 321-268-6110 or visit parrishhealthcare.com/events. Your Parrish Healthcare cardiovascular team is a member of the Mayo Clinic Care Network. Learn how our proven quality and safety track record in the prevention, diagnosis, treatment and rehabilitation of heart, pulmonary (lungs) and vascular disorders can play an important role in your overall health and wellbeing.